In a baroquely-rendered 1965 New England island colony, two twelve-year-old lovesick loners - Sam (Jared Gilman) and Suzy (Kara Hayward) - run away from their scout camp and privileged family respectively. Longing for a life of shared romance and adventure, they revel in being outlaws on the run from Sam’s scoutmaster (Ed Norton), Suzy’s parents (Bill Murray/Frances McDormand), the local police chief (Bruce Willis) and, most threateningly of all, a steely representative of Social Services (Tilda Swinton). At this point it seems almost redundant to say this, but it may be worth restating: Wes Anderson’s sensibility and aesthetic have become so refined that you are likely to know far in advance whether you are going to enjoy his latest release. Or perhaps we might say that you are likely to know whether enjoying his latest is even a possibility. Those who can respond enthusiastically to his work will have their own canons - the movies in which Anderson’s approach beguiles almost utterly, and ones in which his archness grates more than slightly. Still, those for whom the director’s work has never seemed magical at all, not even once, now seem unlikely ever to be won over, so dependable is this particular vision. It will be interesting to see if this will still be true in ten or fifteen years, but at present it seems a foregone conclusion that the potential audience for each new movie will be divided up neatly - nearly as neatly as an Andersonian composition - into hopeful friends and unconvertible foes. As regular readers are no doubt aware, I am certainly someone who has fallen under this writer-director’s spell on more than one occasion, and have expended many a word trying to pin down his (and his fellow travellers in 'quirky') significance and appeal. It seems necessary to be somewhat partisan and confessional here because the question of whether one can relate to Anderson’s films seems very much akin to asking whether one can imagine relating to Anderson as a person - or at least as a type of person. His style is not only unique, but it also feels an organic extension of a specific set of psychological processes and a horizon of emotional possibilities. There is an unconscious in his symmetrical framings; a delimited toolkit of feeling in his colour pallets; a philosophy of mind in his deadpan. I find I am able to entertain the thought of holding a pleasurable conversation with such a mind; others will not. Moonrise Kingdom captures especially precisely and successfully some core features of the kinds of thinking and feeling that together make up the Wes Anderson philosophy. Seek out or avoid this movie depending on whether that idea fills you with dread or delight. There are numerous pleasures to the film. The two central children, Sam and Suzy, are perfect Anderson protagonists: unwaveringly committed in their passions, and simultaneously destined to have those passions thrown into relief by limitations that they cannot quite see - in this case because of their ages. Of course, the adult characters can offer little more by way of life advice: they are either uncommunicative (Murray), chronically confused (McDormand), adrift (Willis), or incompetent (Norton) - though all forgivably, charmingly so. Walking a middle-ground between the rollicking adventure stories of The Life Aquatic (2004)/Fantastic Mr. Fox (2009) and the smaller-scale dramas of Rushmore (1998)/The Royal Tenenbaums (2001), the narrative avenues open to this precious-yet-fantastical comedy of the heart are winning in their unpredictability. Whereas some Anderson films can strain themselves in pursuit of drama in their later stages, here there is great joy to be taken from the willfully absurd ways the stakes keep getting raised. This is because the requisite manner and tone have been struck and properly maintained - a process in which Benjamin Britten’s ‘Young Person’s Guide to the Orchestra’ has played no small role: grand but generous, serious but undercutting its pomposity, the piece that opens the film also serves as a useful reference point for its strategies throughout. There are elements that work less well: Murray seems, for the first time, rather unimaginatively used; Swinton is given disappointingly little to play with; there is perhaps a set-piece or two too many. For the most part, though, Moonrise Kingdom is a wholly worthy addition to a private, expanding world into which some of us remain happy to have felt invited. 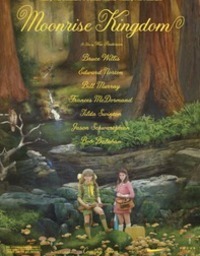 Read John Bleasdale's feature on Anderson and Moonrise Kingdom here. This review was published on June 05, 2012.